1. Plan ahead. We went from a regular start calendar this year to an early start. Because of this, my timing was off on all of the teaching. And since the timing was off....FRACTIONS got the shaft. Fractions! UGH! How could I have given fractions the low end of the priority scale???!! So next year, knowing that the timeline is a bit wonky with the new calendar, I am going to start EARLY with everything that needs to be done in the fraction realm. Because seriously, adding, subtracting, multiplying, dividing, simplifying, comparing, mixed numbers, improper fractions (and the list goes on) can not be done in 3 weeks. 2. Focus on typing. We are lucky enough to have a computer lab at my school. When we go in, sometimes the students practice typing, sometimes they don't. Next year, they will start every.single.time with our typing program. Why you ask? 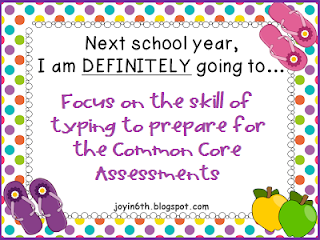 Because Common Core is on the horizon and those Common Core assessments (ie: the BIG TEST) will be taken on the computer. If the students get hung up on the typing part, they won't be focused on the actual information they know. I don't want the typing to hinder them. So we will practice. 3. Slow Down. I feel like I was always rushing. I just want my kids to "be done" so we can move on to the next thing. At times, I feel like I did sacrifice some more in-depth learning because of the constant go. So next year, we will be doing a bit more "yellow light" in my room. OK...that is enough planning for my brain today. What do you plan to do as this year draws to a close in preparation for next year? What typing program do you use? My school has a site license for Mavis Beacon. The kids enjoy it and it really does seem to teach them how to type. We just have to do it more! Thank you for reminding me about typing/keyboarding! My school is ordering a keyboarding program to use next year as well. Scary to think how much rides on them being able to type well, especially as I watch my 5th graders take 10 minutes to type one sentence out now! Any chance of a 4th grade version of the language arts review? Your spiral math is fantastic, and I plan to start it right away in August. I'm also going to use paragraph of the week that was so SUPER for my 4th graders this year. What growth in writing I saw! Our math consultant told us that our whole district does poorly on fractions on testing and I said maybe it is because we teach it near the end of the year and rush through it to prep for the test!! 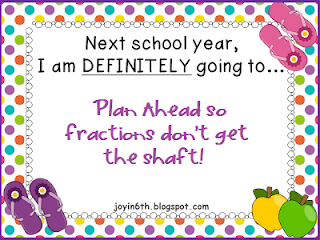 Fractions is such a huge part of math and hard for many kids yet I feel like I rush through it every year! Excited to see what you come up with for Spiral Language! There are just SO many fraction concepts to go through too! Ours happens during second quarter and because of the calendar issues this year, the main chunk fell during our winter program....so practicing "Twas the Night Before Christmas" came first, and math suffered. Now, I will be prepared for next year to combat that! I can relate to the pacing of lessons goal. It was actually one of my goals, too. I like the idea of your typing goal, too. I think that it is very important that our students learn how to type correctly so that they'll be able to focus on the content rather than the typing. One more thing...I need to slow down, too. I feel so rushed all the time! So excited to see that you're going to work on a Lang. Arts Spiral Review! With CCSS, 5th grade is the focus year for Fractions. I struggled last year to get all of the fraction stuff in, I really had to pace myself this year and was able to get it in. It's a tough concept for some 5th graders. I love your plans for next year, best wishes on accomplishing them all! I agree with you teaching typing. The kids can click and manipulate things just fine, but typing takes a while. I am going to look up Mavis Beacon, and see if my building is interested in using it. Yay Yay Yay!!! 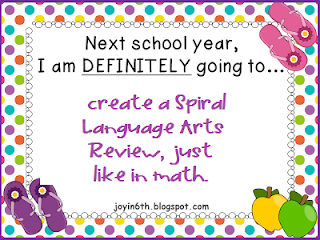 I am so excited about the spiral language arts review!!! I love the idea of the math one, but I teach ELA, so I have seriously been looking forward to a language arts one! Good luck with your last week of school, this is my students last week as well. Happy summer! I like Type to Learn 4 even better than Mavis Beacon (have used both). Currently our school is using a free online program called typingweb.com. Our fifth and sixth graders liked it, so we will be using it with third and fourth as well. It is pretty comprehensive and flexible for being free!